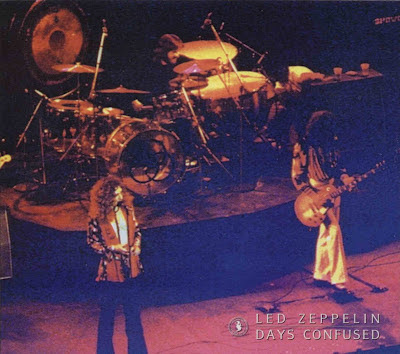 Recorded Live at Memorial Auditorium, Dallas TX, USA - March 05, 1975. Excellent Soundboard + Audience Recordings :: Silver CDs :: MP3 CBR 320 kbps & FLAC. Files: 31.:: Size: 840.09 MB (mp3) | 2.23 GB (flac). Notes: Days Confused is the latest Empress Valley release from their stash of 1975 soundboards. The band booked five shows in Texas at the beginning of the second half of their tour beginning on February 27th in Houston. The others include March 3rd in Fort Worth, the two in Dallas and finally March 7th in Austin. The two Dallas dates were always said to have occurred on March 4th and March 5th based upon ticket stubs and newspaper evidence. 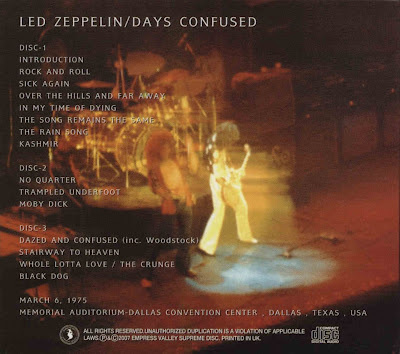 With the 2003 release of the first night’s soundboard on Chasing The Dragon came the claim that the shows were actually moved back a day so according to Empress Valley the proper dates are March 5th and March 6th, so the second night in Dallas on Days Confused is labeled March 6th instead of March 5th. In the intervening years there has been nothing to confirm the memories of Empress Valley’s commentator and the physical evidence points to the original assumptions about the date being correct. 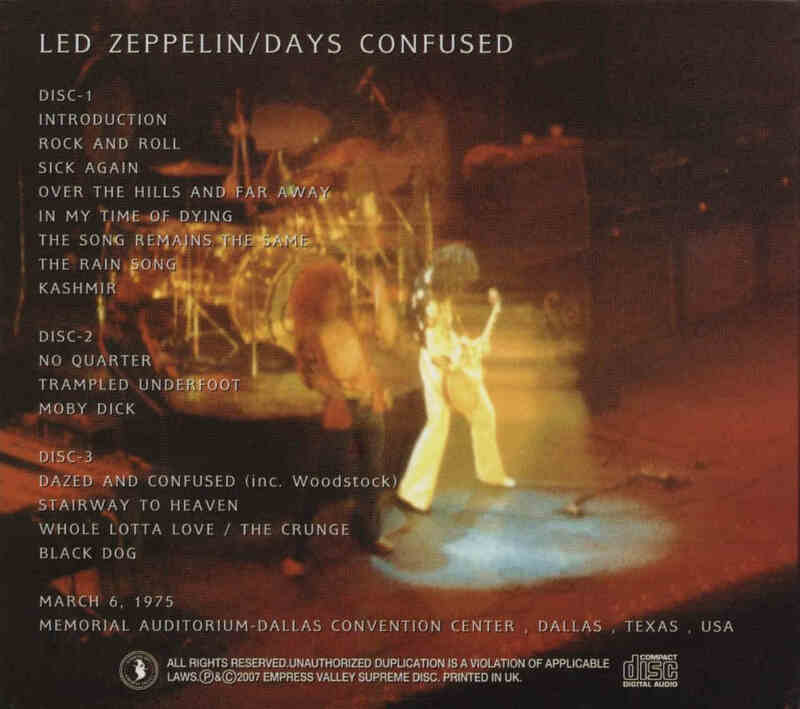 Until something else surfaces that can corroborate their story we can assume that this recording is the second show in Dallas on March 5th. All of the soundboards released so far by Empress Valley from this era have been remarkable for their balance, clarity and detail and this one is similar to the others.<-(Info taken from Collectors Music Reviews). Recorded Live at Taiikukan Tokyo, Shibuya, Japan - December 02, 1976. Files: 39. :: Size: 280.79 MB (mp3) / 865 MB (flac). 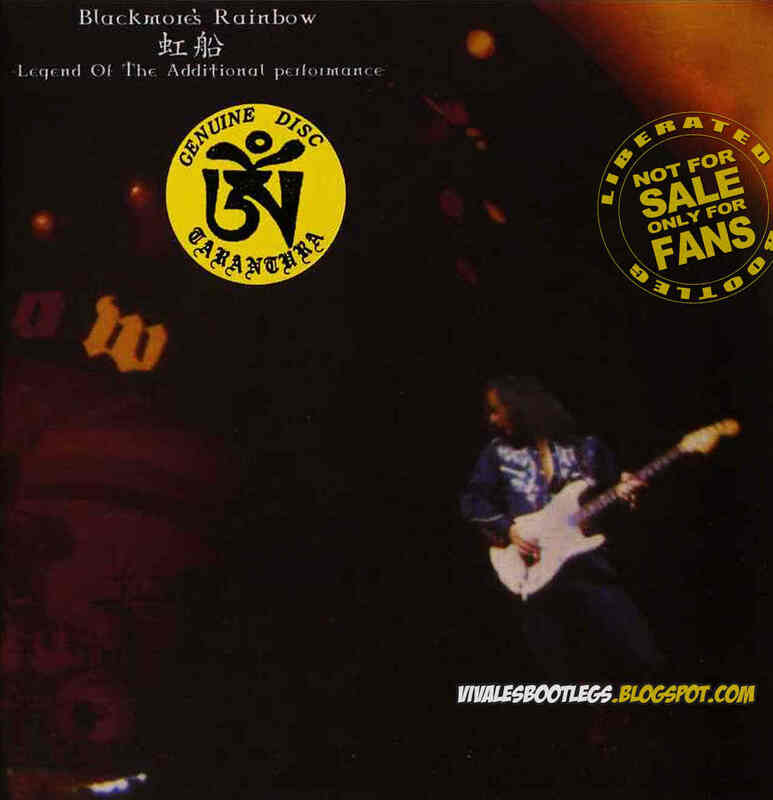 Personnel: Ritchie Blackmore: Guitar :: Ronnie James Dio: Vocals (R.I.P.) :: Jimmy Bain: Bass :: Tony Carey: Keyboards :: Cozy Powell: Drums (R.I.P.). Notes: * Edited With Aquarius Uijin Master Tapes. Review from Collectors Music Reviews: With the very recent, untimely passing of the great Ronnie James Dio, listening to Tarantura’s Legend of the Additional Performance brings extra significance to this reviewer. 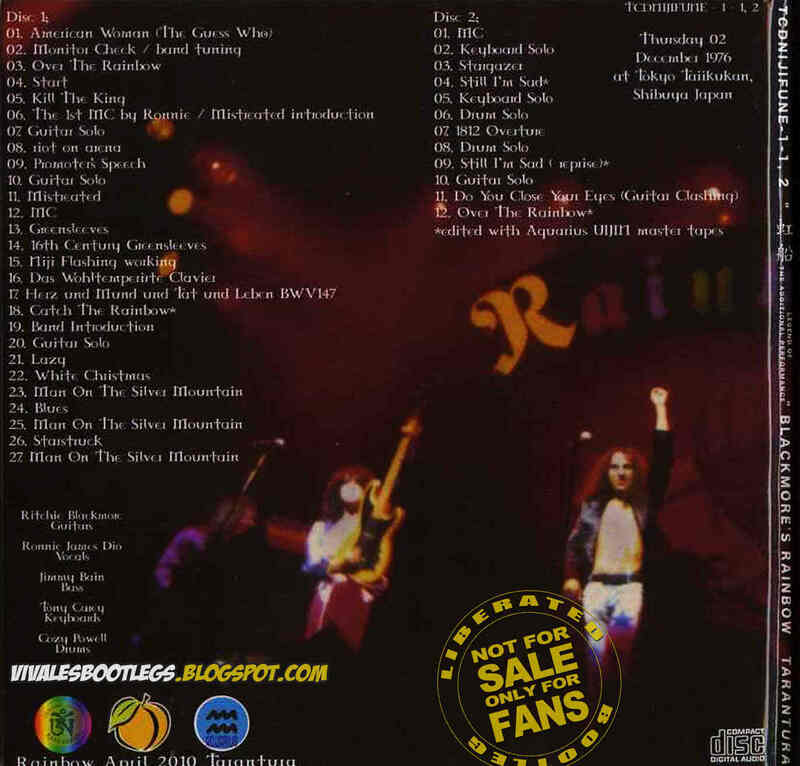 For us fellow collectors of Tarantura’s wonderful run of vintage, previously uncirculated live Rainbow, a recording of this concert was debuted by Tarantura in April, 2009 on its Uijin’ (TCDRAINBOW-3-1, 2) release. That title was sourced from the original master cassettes from Aquarius, and it has already received a thorough, detailed review on this site by relayer67. In Legend of the Additional Performance, Tarantura present this show in significantly upgraded audio sourced from Mr. Peach’s master cassettes. However, where there were gaps in Peach’s recording, Tarantura filled them with Aquarius’s master tapes. As a result, the listener is furnished with the ability to appreciate the expansive, beautiful dimension that makes Peach’s recordings so precious. The first example of this occurs in “Catch the Rainbow”. The vocal harmonies were captured exquisitely by Peach, as were Powell’s tom-tom fills, cowbell, Carey’s synthesized backing, and Blackmore’s emotional runs. Blackmore’s solo midway through the song was particularly aggressive, driven from behind by Powell’s signature (albeit somewhat predictable) fills, when at around 10:20 in the track Aquarius’s recording is patched in and the difference between the two sources can be appreciated for about 25 seconds before Peach’s recording drifts back into focus. And it is at that point that you are treated with Dio’s remarkable vocal soloing about catching the rainbow and riding the sky before Blackmore peacefully ended the song. Simply gorgeous, and all presented with great clarity. 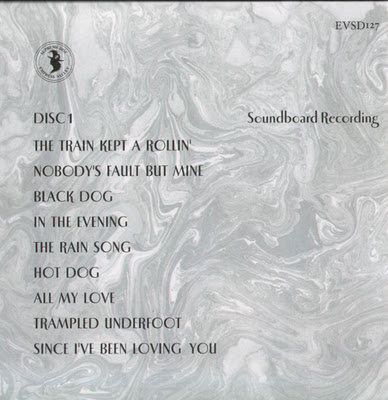 The next instances of Aquarius’s master recording patching Peach’s source can be found at the first 10 seconds of “Still I’m Sad”, just as the band explodes into the song, toward the end of the song’s reprise after Carey and Powell’s soloing, and with the show closer of “Over the Rainbow”. The title’s sturdy jacket, which displays a triumphant on stage image when opened fully, also contains images on the inside of the Sony and Maxell original cassette tapes used to create this one-of-a-kind production. 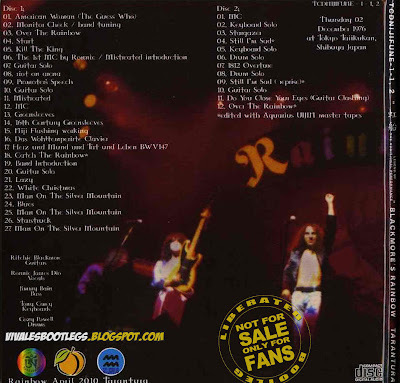 And it is with those words that this title is enthusiastically recommended for any collector of Rainbow’s live catalog.<-(Info taken from original info file). 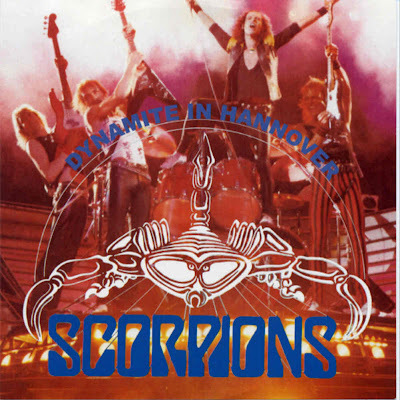 Recorded Live at Eilenriedehalle, Hannover, Germany - November 02, 1984. Excellent Soundboard Recording - Silver 2CD set - FLAC. Files: 21. :: Size: 224.21 MB (mp3) | 720 MB (flac). 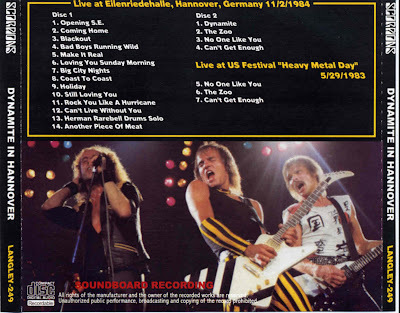 Personnel: Klaus Meine - Vocals :: Herman Rarebell - Drums :: Francis Buchholz - Bass :: Matthias Jabs - Guitar :: Rudolf Schenker - Guitar. Tour: Love At First Sting. Recorded Live at Eissporthalle, Berlin, Germany - July 7, 1980. Excellent Soundboard + Excellent Audience :: Silver CDs :: MP3 CBR 320 kbps & FLAC. Files: 29. :: Size: 644.99 MB (mp3) | 1.42 GB (flac). Notes: Complete Show in Soundboard + Audience. On discs three and four EV use an excellent sounding audience tape which is much better at picking up the atmosphere of the gig. It is close to the stage, very clear and is one of the best sounding tapes from the tour. 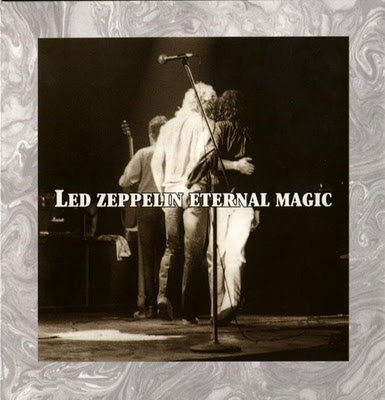 While the soundboard recording is very good, Eternal Magic fills a considerable need because it is the only title to feature a complete audience tape from this show and is essential for those of us who prefer audience tapes to soundboards.<-(Info taken from original info file + collectors music reviews).